Kuwana is a smallish city located in northern Mie Prefecture, facing the Pacific Ocean. 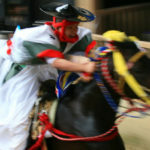 It is located at the mouth of the Kiso Three Rivers dividing Mie and Aichi Prefectures. 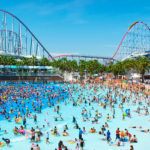 Although the city doesn’t offer a lot of interest for foreign visitors, the nearby Nagashima Spaland is well worth a visit and if in the area during Golden Week in early May, the Tado Festival is fun to watch.